Diplomacy is not a popularity contest, but understanding how others see us is the first step in working out how to influence them. What sort of diplomatic actor is Australia, as far as some of our key partners are concerned? The advent of a new US administration is always a busy time for policy thinkers, as leaders in all walks of life and diplomats around the world reassess how all the pieces fit together. On this occasion, that regular adjustment has taken on a new urgency. The international implications of this could well be significant. For Australia and Australia-watchers, the early focus was on that phone conversation between Prime Minister Turnbull and President Trump. The thing that struck me most that week, though, was not the conversation itself, but the public reaction it provoked in the United States. From Australia’s point of view, the real story of the phone call was one of diplomatic ballast in action. But it did raise an important question, one that every generation of diplomats this nation produces has to ask itself: how is Australia seen, around the world? Diplomacy is not a popularity contest, but understanding how others see us is the first step in working out how to influence them. What sort of diplomatic actor is Australia, as far as some of our key partners are concerned? How a country perceives its international interests, and other diplomatic actors, can change over time, of course, driven by historical developments, shifting strategic circumstances and political will. Consider the United Kingdom, a country which has been in the news almost as much as the United States in the last year. Diplomatic relations between Australia and the United Kingdom are close. In the years ahead, Australia can make much, much more of the rock-solid trust with which our counterparts in the UK see us. After more than four decades within the European Union, Britain is now charting a new, independent, course – “Global Britain”, as Boris Johnston calls it. Consider this: when Britain applied to enter the Common Market in 1961, only five years had passed since the Suez Crisis. From Whitehall, Australia appeared, in 1961, as a young country on the international stage. Now, though, the British see a highly successful, independent regional and global actor. Partners in our region are also seeing Australia in a new light. As China’s rise continues, the question of how it will exercise power becomes more pressing, and major countries are interested in the part Australia plays, and will play. Japan for one. As the Foreign Minister said recently, the practical engagement between the defence forces of the United States, Japan and Australia is, today, a first-order strategic fact. After having built our trade and economic partnership over many decades, Japan now sees Australia as its primary ally in keeping the United States informed and focused on strategic issues in Asia. This includes trade and investment­—indeed, countries in our region are looking to Japan and Australia to advocate in Washington our shared perspectives on the strategic dimension of economic liberalisation. Like Japan, India is reassessing its place in a world changed by China’s rise. As India steps out from the Non-Aligned Movement, and emerges as a maritime power, it finds more points of interest in Australian diplomacy. India still values multilateral diplomacy highly, and India’s diplomats appreciate the energy and effectiveness we bring to it—even when they are inclined to apply the handbrake. India admires our highly productive relations with Japan, which parallel its own, and is seeking triangular cooperation on infrastructure and high-efficiency coal generation. India has also taken a new interest in the quality and consequence of our alliance with the United States. “Today, the world sees Australia at the heart of the Asia Pacific and Indian Ocean region,” Mr Modi said. In part, Prime Minister Modi’s words reflect the strategic adjustments underway in the Indo-Pacific, as states position themselves to benefit from opportunities and hedge against risks. In Beijing, all nations compete for influence. China has a score of challenging bilateral relations, in particular with countries on its land and sea borders. Where does Australia stand? Next week, Li Keqiang will arrive in Australia for his first visit as Premier of the People’s Republic. Prime Minister Turnbull and Premier Li will sit down across a table to discuss the full range of bilateral and international issues as part of the fifth annual leaders’ meeting. If you were a fly on that wall I suspect one of the deepest impressions you would be left with is that China regards Australia as a serious country. There is a tendency in Australia’s public discourse to focus on China’s importance to us. I can assure you that it is a two-way relationship. China understands clearly the importance we attach to a rules-based international order and universal values. In Beijing, we are a palatable, and, occasionally, sought-after source of government-to-government advice. China values our economic relationship and our growing community ties. It welcomes the expertise and capacity we bring through our growing services exports. And it recognised the value to both economies of agreeing to the most ambitious free trade agreement it has signed—the China-Australia Free Trade Agreement (ChAFTA). Australia–China relations have been a success for Australia, but we will have to keep working hard to build on this foundation. Closer to home, the way that the Government of Indonesia views Australia matters a great deal. Indonesia and Australia are as different as any two neighbouring countries in the world, yet we loom large for one another. Indonesia does not have a long tradition of southward diplomacy—ancient trade routes, yes, but government to government diplomacy, no. In fact, Java’s dangerous southern waters helped inspire a legend of a demon goddess that lured to their destruction anyone who set sail in our direction. Relations have come a long way. The storms are less severe nowadays, and in a fair wind we can both make progress. Our development-assistance relationship is changing to one of economic partnership. The new trade-liberalising commitments that Prime Minister Turnbull and President Widodo made last month are an excellent development in themselves, and augur well for a wider trade agreement between Indonesia and Australia. Closer trade and investment ties will mean that more Indonesians come to appreciate Australia as a diverse and thriving place to do business and visit. A key question for Australian diplomacy is what influence we will have in Indonesia as it grows in stature. As Indonesia reaches its potential as a top-10 or even top-5 economy, with strategic weight to match, we want Indonesia to look to Australia as a reliable source of acute judgements and sensitive advice. As Australia makes its way in the 21st Century, we have reason to be confident but no cause for complacency. By being clear on how our major partners see us, we can calibrate our ambition, and effectively target our diplomacy. In my recent international visits, I have found again and again that other countries want to do more with us. In part, this is because of who we are and how we work: we’re capable, effective, reliable, we have little baggage; we are nowhere maligned and generally liked. In part, it is because the world is turning in our direction. We have a new relevance to traditional partners as they reassess their global interests. India and Japan see us as increasingly important diplomatic actors. Indonesia is still forming its view of Australia as an international partner—this will be a gradual process over the decades ahead and it is a very important one for Australia’s national interest. Already, China is a potentially decisive actor on the most important international issues. Our diplomatic engagement with China will only become more consequential as the years go on. It is crucial that Australia wields diplomatic influence congruent with our opportunities and challenges—not just in Washington and London, Tokyo and New Delhi, but in the capitals and commercial centres throughout our region. 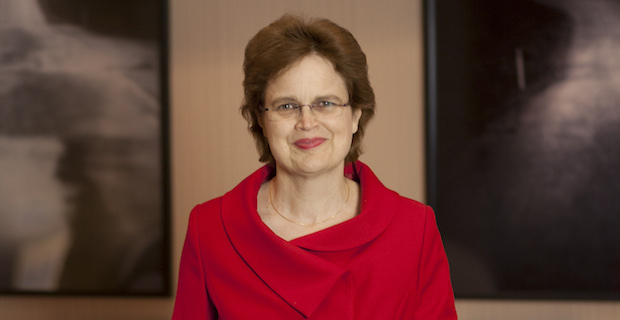 Frances Adamson is the Secretary of the Department of Foreign Affairs and Trade. Prior to her appointment she was international adviser to Prime Minister Malcolm Turnbull and before that served as Australia’s ambassador to the People’s Republic of China among other roles. This is an edited excerpt from Frances Adamson’s speech given at the AIIA ACT Branch’s annual dinner on 15 March 2017. Read the full speech here.